The British General and soldiers arrived in the summer during the 1870s as did everyone who traveling to Hunza. This was the harvest season for the grains, fruits and vegetables from the gardens, and much of the food was consumed raw. Because fuel for cooking was saved to be used in winter for boiling meat and providing some heat for the stone dwellings, very little meat was consumed in summer and vegetable were eaten raw. Curious visitors who followed the British soldiers to Hunza Valley years later naturally arrived in summeralso, and the summer diet of the people led visitors to assume they were mainly vegetarian and ate very little meat. This was typical of the summer harvest season. Many primitive cultures including cavemen lived in a similar manner, gorging themselves on available fruit during the short season and eating mostly meat for the rest of the year. The people of Hunza differed in that they never had an abundance of anything except rocks. They did not have enough animals to provide abundant meat during the winter because of the lack of fodder. They did not want to kill female animals that were milk producers unless the animal was old or lame.The Hunzakuts are said to have cultivated plants included barley, millet, wheat, buckwheat, turnips, carrots, dried beans, peas, pumpkins, melons, onions, garlic, cabbage, cauliflower, apricots, mulberries, walnuts, almonds, apples, plums, peaches, cherries, pears and pomegranates. John Clark did not find green beans, wax beans, beets, endive, lettuce, radishes, turnips, spinach, yellow pear tomatoes, Brussel sprouts or parsley. Cherry tomatoes and potatoes are thought to have been brought in by the British. The long list of currently grown plant varieties should not be a consideration when discussing the longevity of the Hunzakuts and their past diet. Apricot trees were very popular, and the fruit was eaten raw in season and sun dried for winter. The pits were cracked to obtain the kernel that was crushed to obtain the oil for cooking and lamps. The hard shell was kept for a fire fuel. 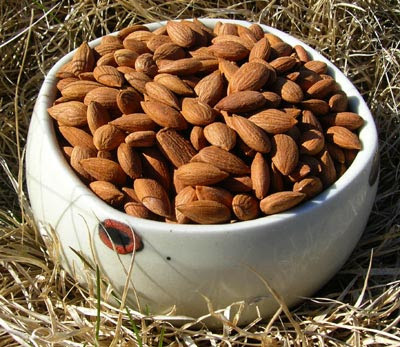 The kernel and oil could be eaten from the variety of apricots with a sweet kernel, but the bitter kernel variety had an oil containing poisonous prussic acid. Click the picture to see an enlargement.The apricot trees were allowed to grow very large in order to obtain the maximum yield. Picking the maximum amount of fruit was more important than the difficulty in picking. The children would scamper to the higher branches to pick or shake off the fruit. Planting new trees required several years of growth before any fruit was produced. The special garden silt or glacial milk did not contribute to the age or size of the trees as is commonly claimed. Our modern orchards are not managed that way because we have abundant space and picking is expensive. Our trees are cut when the size makes them difficult to harvest, not because they fail to live as long as those in Hunza. Mulberries, which resemble blackberries in size and shape, are a favorite fruit. When fully ripe, their flavor is sweet-sour but somewhat bland. The variety grown in Hunza was most likely a golden color.A large variety of indigenous wildlife including markhors sheep, Marco Polo sheep, geese, ducks, pheasants and partridge provided the early Hunza hunters with meat in addition to their sheep, goats and domesticated Yaks. Chickens were also raised for meat and eggs until sometime in the 1950s when they were banned by the Mir.The Queen and her children traveled on Yaks while the King and other men rode horses. The Yak is a strong wild animal which they domesticated for for traveling in the mountains as a beast of burden pack animal. 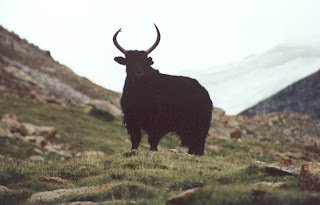 In addition to Yaks, which provided milk and meat, the Hunzakuts also had goats, sheep, cows and horses. However, there were very few cows or horses in Hunza in 1950 because they consumed a lot of fodder compared to goats and sheep. The Yaks, goats and sheep were herded in the summer to areas just below the snow line for feeding on sparse grasses and plants. They were milked by the herders who made butter that was delivered back to the people in the villages below. The herders had plenty of milk to drink that valley people lacked. The Yaks were also milked. Cows and horses could not be herded to the higher elevation because the vegetation there was simply to sparse.The picture is of the Cathedral Peaks as viewed from the village of Ghulmit 23 miles (37 km) upriver from Baltit near the northern end of Hunza. Summer grains are seen growing in the foreground. The Mir's main Palace was in Baltit, but since firewood was more abundant in Ghulmit, he chose this location for his winter residence. Click the picture to see an enlargement. A great celebration was held to commemorate the barley harvest, the first harvest of the early summer to break the spring starvation period. The barley was ground, mixed with water and fried to make a pancake style bread called chapatis, and hot stones were used for cooking the bread prior to the availability of steel plate or cast iron griddles. The bread recipe would change to whatever grain was available. Wheat was harvested later in the summer. The Hunza bread recipe found in books and on websites is nothing whatsoever like the various breads of the Hunzakuts. The primitive Hunzakuts ground grains between two rocks much like the North American Indians. They had constructed a water wheel powered stone grinder by the time John Clark had arrived, but many people still ground the grain by hand.To their credit, the Hunzakuts did developed a double-crop farming method. Barley was the first crop harvested, then replaced by millet. Wheat was harvested later in the summer followed by winter buckwheat. 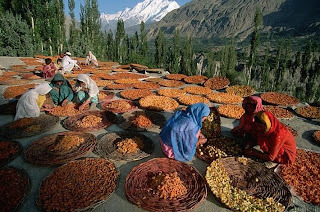 The double-crop planting method was done to make the maximum use of the valuable land, not because grains matured faster in Hunza as often claimed.In summer meat was conserved for very special occasions and festivals. Livestock were much too valuable to be killed indiscriminately, so animals became a major source of food only during the cold winter when other foods ran out. We offer straightforward get and drop-off choices, so you'll have the ability to get from stream way to deal with escape auto without redirecting from your get-away furrow. Book Islamabad auto utilize with unpleasant landscape specs and an extensive boot for all your experience prepare, or run rigid marvelous with a lavishness ride. Rent a Car in Rawalpindi You can keep your carbon impression little with half and parts and parallel stop like an expert on involved streets with a traditionalist or economy roadster. In the event that you're going for business, by then unquestionably, drive to rouse.